Each Artifactory instance is a critical resource for the organization using it, but zooming out to the level of the whole enterprise, some Artifactory instances are more critical than others. For example, an Artifactory instance used in production systems is likely to be more important than one used only in development environments. If, for any reason, any of these Artifactory instances become unusable, the enterprise must instantly fail-over to an alternative instance to ensure that all users and automation tools using the downed instance continue normal operation. 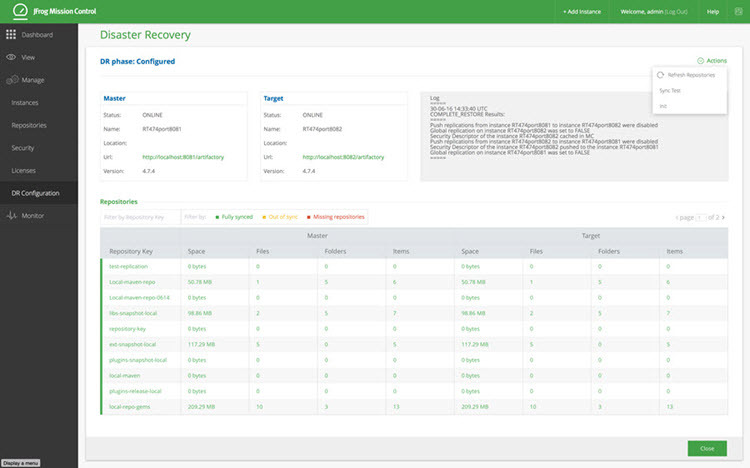 As the centralized dashboard for all your Artifactory instances, JFrog Mission Control is the perfect place to configure disaster recovery. This is implemented by configuring complete system replication between Master instances and corresponding Target instances where a Master instance holds critical data you want to protect against irreversible damage, and the corresponding DR Target is the replication target of the Master. Once DR is setup and configured, failing over to the target instance can be invoked very quickly so Artifactory users continue to get service transparently without having to make any changes to their environments. Once the damaging event is remediated, Mission Control lets you gracefully and transparently revert back to using the master instance, while the affected Artifactory users remain oblivious of these changes happening in the background.